Get Educated! Get Tested! Get Involved! 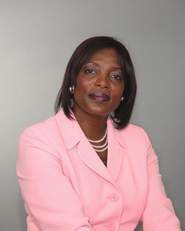 Mrs. Collison is a native of Guyana who currently resides in Rancho Cucamonga. She is married and has a 17-year-old son. Guyana (full name is Republic of Guyana) is a tropical country situated on the northern coast of South America. It is the only country in South America where English is the official language. It is bordered by Venezuela on the west, Suriname on the east, Brazil on the south and the Atlantic Ocean on the north. Ms. Collison came to the United States in the late 1970’s to attend Adelphi University in Garden City, Long Island, on a full track scholarship. She received her BS in Banking and Money Management and MBA in Corporate Investment and Finance while at Adelphi University. She was among the fastest 400-meter runners and held a world record in the 400 meters in the late 1970’s and early 1980’s, racing at Madison Square Garden, and was a silver medallist in the 1979 Pan Am games in Puerto Rico on behalf of Guyana. While racing for Guyana in the 1984 Olympics in Los Angeles, she realized that Southern California was where she wanted to live. Mrs. Collison has over 18 years of healthcare management and finance experience. During her tenure as Chief Financial Officer for St. Luke Medical Center Pasadena, California, June was named Woman of the Year for the City of Pasadena in 1994. She also was designated Chief Financial Officer of the Year in 1998 and 1999 for the Tenet Healthcare Corporation. June was the Chief Operating Officer at Arrowhead Regional Medical Center since October 2000 and was appointed Acting Chief Executive Officer of the Medical Center in March 2004 when the current CEO Mark Uffer was promoted to CAO of the County. She actively oversees daily operations of the 373-bed Medical Center, three Family Health Centers and a combined staff of more than 2,500.